It was caused by poor management/decision-making, a mark of BP. It's getting worse before it gets better. At its core, the oil spill is both a horrible disaster and terribly instructive. People care about environmentalism in lots of circumstances. The oil spill, mountain-top removal, rainforest deforestation, whales - the best example for how action on climate change should be moving forward is the international measures taken following the discovery of the hole in the ozone layer. We don't even have to be cynical and say that there are all photogenic, which was my gut reaction. But the ozone layer is only somewhat photogenic, being an invisible layer of gas (though you still get scary images like this or (god) this). I don't think that that's the key at all. Instead, we can compare all of these things and the actions being taken to fix/prevent them and deduce a couple of things about how humanity tends to respond to environmental dangers. First, timing is a critical factor. 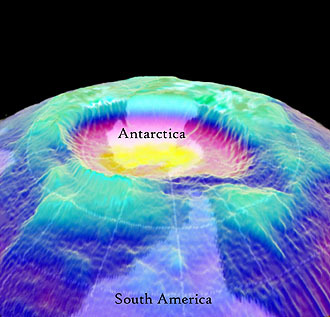 When the hole in the ozone layer was discovered, that was something that was happening right then - it was growing. And the solution was something that we could put into effect very quickly. And, reinforcing that, we could quickly get results. The oil spill is happening right now. It should be stopped right now - we can see that each hour brings a new cost in terms of the amount of oil pouring into the water. And we can see efforts to fix it, right now. Deforestation and similar are happening, but at a slower pace - and they have been happening for a while. We can count how many trees are felled each hour if we want, but generally, people aren't too concerned. That's because of the second factor - location. We are far away from rainforests, so we care less. The people closer to rainforests are the ones getting (badly needed) economic assistance from deforestation. Location - or more accurately, proximity - is yet another reason for the quick response to the oil spill (and it was a quick response, even if it's been mediocrely managed and has only had slow results). The United States is powerful, and we're under threat. Other nations are more moved to consider their own potential oil spill problems (though I'm sure they've all been very helpful). But the proximity aspect of a threat is strange, because the human mind is not logical. A global threat isn't really a threat against us, personally - especially when it's so far removed in time. And climate change is both removed in time (we'll only feel the real effects in decades, if not centuries) and, generally, removed in terms of proximity. And that's why it's so dangerous. We could end the threat of climate change if we felt threatened enough - but the characteristics of climate change make it hard to feel threatened. At best, we feel like it'd be a good idea to maybe act on that, when we can. Understanding this - through the lens of the flurry of activity surrounding this oil spill - helps in the fight against climate change. The better we recognize how the monster of climate change evades our human-sized perspective, the better we realize that it is a problem, and a problem that requires that we join together. Because there's also a third aspect to threat response; identifying the instigator. BP is an easy company to blame - they're huge, they've got a history of safety problems, and they've made some public relations gaffes in response. Coal companies are easy to blame for mountain-top removal, a whole class of products easy to blame for ozone depletion. But climate change? We can talk about our industrial-age ancestors or that guy in China all we want, but the truth is that it's us. Almost all of us - especially with growing middle classes and industrialization everywhere - have stake in this. And most of us don't want to admit it, so we don't. Climate change is not a serious threat, because if it were, we'd be forced to blame ourselves.